Anheuser-Busch has been pilot marketing, with nationall rollout planned for later this year, its new 12oz (354ml) Bud Light Vented Can – featuring a self-contained venting tab that delivers the ‘world’s smoothest drinking experience in a can’ and which is also intended to optimise delivery of the beer’s flavour. The Anheuser-Busch Global and supplier, North American Innovation Group, have been developing the Bud Light Vented Can for more than two years to ensure the self-contained vent mechanism created a better can drinking experience that was also easy to use. Meanwhile, Molson Coors Canada has unveiled a new vented can that it has been rolling out nationally since June for two of the top selling brands in the country, Coors Light and Molson Canadian. This is the first twist tab vented can in Canada. The vented can has a specially designed top with a distinctive red tab and a button-shape to the right of the can opening. Activation of the vent can be achieved in three easy steps and doesn’t require the aid of special tools: Open; Turn – align the red tab over the button; and Vent – Press down to activate extra opening. “Our research confirms that consumers really love this idea because it enhances their experience with the beer. We were careful to design the technology to be easy and fun to use, with the benefit of an additional opening for a smoother pour,” says Kristi Knowles, vp of marketing and innovations at Molson Coors. 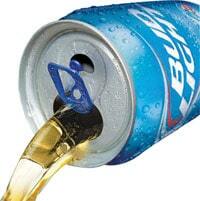 There are currently no other vented cans available within the beer category in Canada. The can was developed exclusively with supplier, Crown Holdings, through extensive R&D and are the result of several years and evolutions of concepts and prototypes. The introduction of this new vented technology comes after a string of other successful packaging innovations for the brewer including Coors Light’s two-stage cold certified bottles in 2008, and last summer’s launch of aluminium wide-mouth bottles; and Coors Light vented wide-mouth cans in 2008. This summer, the vented can will be on 50 million x 473ml and 355ml cans. Expect further expansion of this innovation will run into 2014.